An Australian emollient brand had to compete against major players, such as E45, in the UK. Regular application of emollients is the best way to manage eczema, but research revealed parents and healthcare professionals struggled to get children to use them. We created a fun character to help improve compliance across a range of campaign materials, from an iPhone app to in-clinic play kits. QV is an Australian range of emollients for dry, itchy skin. In the UK, it’s up against big-budget brands like E45. Distributor Crawford Healthcare couldn’t outspend the leaders, so they aimed to outsmart them instead. One sector of the emollient market – eczema in under-5s – has a compliance issue. It’s well served with treatments, but there’s a shortage of engaging help and information for kids and their parents. Youngsters with sore, itchy skin aren’t always co-operative. In fact, research conducted with 500 parents revealed that 79% were forced to use distraction techniques to encourage their children to have eczema creams and ointments applied. Parents at the end of their tether need more help than a pot of cream and a technical leaflet. And healthcare professionals would love to offer more than reassuring words. Parents and professionals both want children to apply their emollients more often, with minimum fuss. 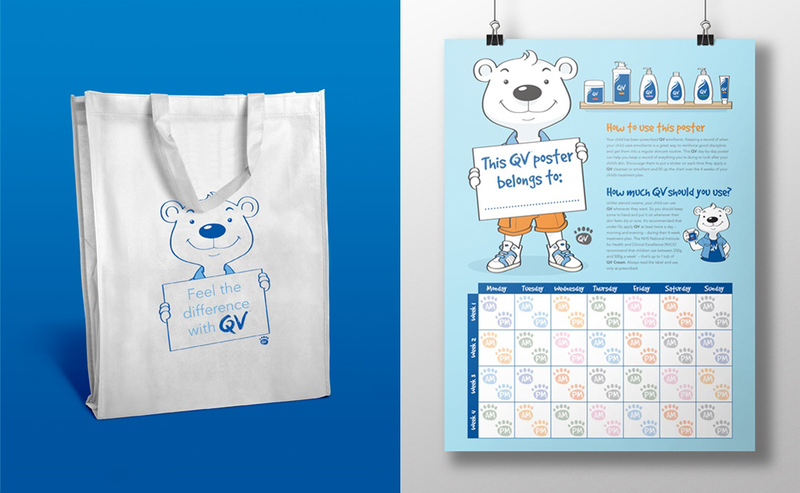 We had to find a unique way to encourage children to interact with the QV brand and see the process as just part of their day. What could engage children more than a cute, cuddly polar bear? We developed our Qool Vince (QV) character to create a point of difference in the busy emollient market. 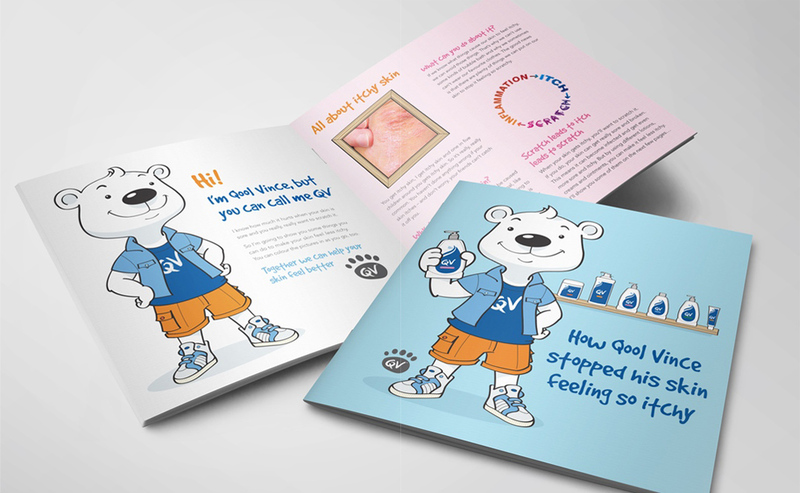 As well as putting the brand name firmly in the mind of parents and professionals, Qool Vince is a sufferer too, so he can talk directly to kids and help mums and dads with advice for bath time, bedtime, playtime and school. Qool Vince appeared everywhere: dot-to-dot books, colouring sheets, and wall charts with reward stickers to help kids and parents keep track of treatments. To support dermatology nurses and GPs, we also created play kits and information packs for kids to use in clinic waiting rooms. 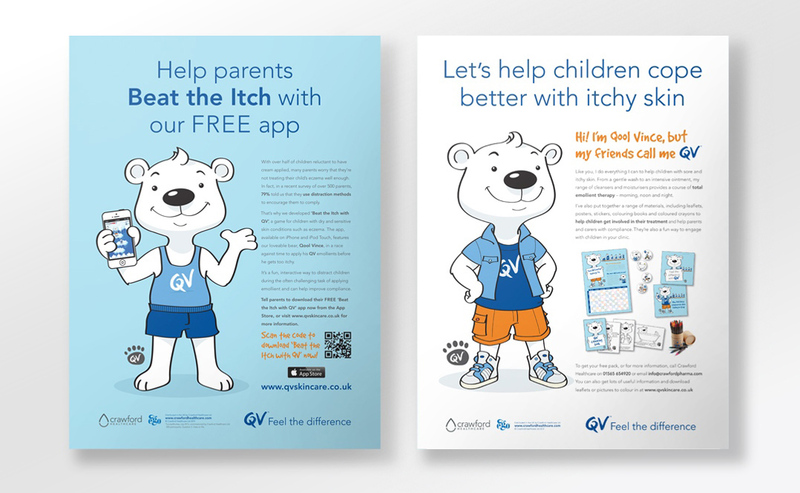 We even developed a fun, free app, called 'Beat the Itch with QV', to educate parents on the importance of compliance, while encouraging children with eczema and other dry skin conditions to apply their emollients. The app is available on iPhone and IPod touch, and provides the ultimate distraction as kids navigate Qool Vince through an exciting Arctic adventure. The activity was supported with trade press, clinic materials and website content, including an online colouring competition. Parents, HCPs and, most importantly, kids, have all been very positive about Qool Vince and his helpful attitude.